Linda sat at a table with a piece of rich, dark chocolate in front of her. After breathing in its sweet aroma, she took a small bite and let the chocolate slowly dissolve in her mouth. Her taste buds savored the mixture of creaminess and sweetness. “Wow, that’s the best piece of chocolate I’ve ever eaten!” Linda said to her dietitian. What’s interesting is that this exchange was part of a nutrition counseling session that focused on mindfulness, the concept of being present in the moment, and mindful eating, being aware of all facets of the eating process. Mindfulness continues to gain widespread support to promote health and wellness, and mindful eating is being used as a tool to improve eating behaviors, encourage weight control, prevent chronic disease, and foster a healthful relationship with food. Michelle May, MD, founder of the mindful eating workshops “Am I Hungry?” believes awareness of food and the eating process is a necessary component that facilitates behavior change. “Many of the habits that drive overeating are unconscious behaviors that people have repeated for years, and they act them out without even realizing it,” she says. “The process of mindfulness allows a person to wake up and be aware of what they’re doing. 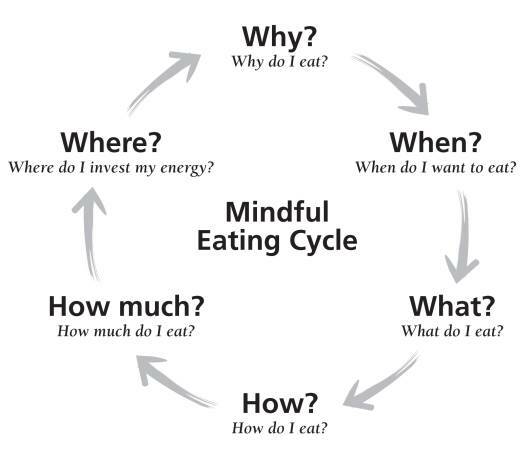 Once you’re aware, you can change your actions.” A visual representation of this eating concept is the “Am I Hungry?” Mindful Eating Cycle (see diagram) from May’s book Eat What You Love, Love What You Eat. Since most people eat for reasons other than physical hunger, the first question of “Why do I eat?” is often central to ultimately changing behavior. • “Why do I eat?” may include an exploration of triggers such as physical hunger, challenging situations, or visual cues, which often spring from stress, fatigue, or boredom. 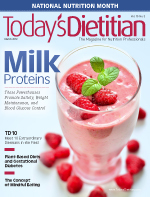 • “When do I want to eat?” The answer may depend on the clock, physical hunger cues, or emotions. • “What do I eat?” examines the factors people consider when choosing food, such as convenience, taste, comfort, and nutrition. • “How do I eat?” Is eating rushed, mindful, distracted, or secretive? In our technological, on-the-go society, exploring the process of eating can be eye-opening. • “How much do I eat?” Quantity may be decided by physical fullness cues, package size, or habit. • “Where does the energy go?” Eating may be invigorating, cause sluggishness, or lead to guilt and shame. How is the energy used during work or play? Ideally, these mindful eating techniques should be used as a framework to give clients additional insight into their eating patterns and not be used as a tool to dictate an appropriate chain of responses. As mentioned, a key component of mindful eating is nonjudgmental awareness of eating patterns. So if the answer to “Why do I eat?” is “Because I’m bored,” there are no rules clients should have to follow commanding which foods are permissible or how much they should eat. Instead, the answers should be viewed simply as information to help clients make informed choices. One of the most researched mindfulness programs is Kabat-Zinn’s Mindfulness-Based Stress Reduction (MBSR). His mindfulness model involves guided mindful meditation practices, gentle stretching, and the discussion of strategies to incorporate mindfulness into daily life. Participants are encouraged to begin meditating daily outside of sessions. “Mindless eating is looking at environmental cues and triggers around eating,” Fletcher says. “Mindful eating is about awareness of internal and external cues that trigger eating.” She adds that the two concepts do overlap when hunger sensations are triggered by the sight or smell of food. Minimizing mindless eating cues also can make it easier for clients to pay attention to their body’s signals. The popular book Mindless Eating: Why We Eat More Than We Think by Brian Wansink, PhD, offers great information and many practical strategies to avoid mindless eating. As nutrition professionals, we’re the experts on choosing the quality and quantity of foods needed for optimal health, yet that’s only one piece of the puzzle for many clients. Mindful eating enables you to become more aware of other factors influencing eating decisions, which provides an avenue to empower clients to make the necessary changes from the inside out. — Cheryl Harris, MPH, RD, is in private practice in Fairfax and Alexandria, Virginia. She has a daily meditation practice and uses mindful techniques in client education. Create a hunger scale ranging from 0 to 10 (0 being the most hungry and 10 being the least hungry). • Where are you right now on a scale of 0 to 10? What do you notice about your body that made you choose that number? Tell the client to keep a journal of his or her hunger rating before, during, and after each meal for three days. The client should note the physical cues that led to the choice of that rating. Additionally, the client should experiment with eating to achieve a different level of fullness. Ask how the client felt one hour after achieving a hunger level of 6 vs. 8. Place a small amount of the food in your mouth, and do not chew it. After 30 seconds (wait 1 minute for chocolate), start chewing. • What did you notice about the flavor or texture before you started chewing the food? After you started chewing? • How does that compare with your typical experience? *Some people associate certain foods with feelings of guilt or rules to follow, so ultimately allow clients to choose their own foods. 1. The principles of mindful eating. The Center for Mindful Eating website. http://tcme.org/principles.htm. Accessed December 20, 2012. 2. Praissman S. Mindfulness-based stress reduction: a literature review and clinician’s guide. J Am Acad Nurse Pract. 2008;20(4):212-216. 3. Kristeller JL, Baer RA, Quillian RW. (2006). Mindfulness-based approaches to eating disorders. In: Baer RA, ed. Mindfulness and Acceptance-Based Interventions: Conceptualization, Application, and Empirical Support. San Diego, CA: Elsevier; 2006:75-91. 4. Kristeller JL, Hallett B. An exploratory study of a meditation-based intervention for binge eating disorder. J Health Psychol. 1999;4(3):357-363. 5. Kristeller JL, Wolever RQ. Mindfulness-based eating awareness training for treating binge eating disorder: the conceptual foundation. Eat Disord. 2011;19(1):49-61. 6. Miller CK, Kristeller JL, Headings A, Nagaraja H, Miser WF. Comparative effectiveness of a mindful eating intervention to a diabetes self-management intervention among adults with type 2 diabetes: a pilot study. J Acad Nutr Diet. 2012;112(11):1835-1842. 7. Daubenmier J, Kristeller J, Hecht FM, et al. Mindfulness intervention for stress eating to reduce cortisol and abdominal fat among overweight and obese women: an exploratory randomized controlled study. J Obes. 2011;2011:651936. 8. Dalen J, Smith BW, Shelley BM, Sloan AL, Leahigh L, Begay D. Pilot study: Mindful Eating and Living (MEAL): weight, eating behavior, and psychological outcomes associated with a mindfulness-based intervention for people with obesity. Complement Ther Med. 2010;18(6):260-264. 9. Carmody JF, Olendzki BC, Merriam PA, Liu Q, Qiao Y, Ma Y. A novel measure of dietary change in a prostate cancer dietary program incorporating mindfulness training. J Acad Nutr Diet. 2012;112(11):1822-1827. 10. Timmerman GM, Brown A. The effect of a mindful restaurant eating intervention on weight management in women. J Nutr Educ Behav. 2012;44(1):22-28. 11. Wansink B. Mindless Eating: Why We Eat More Than We Think. New York, NY: Bantam-Dell; 2006.